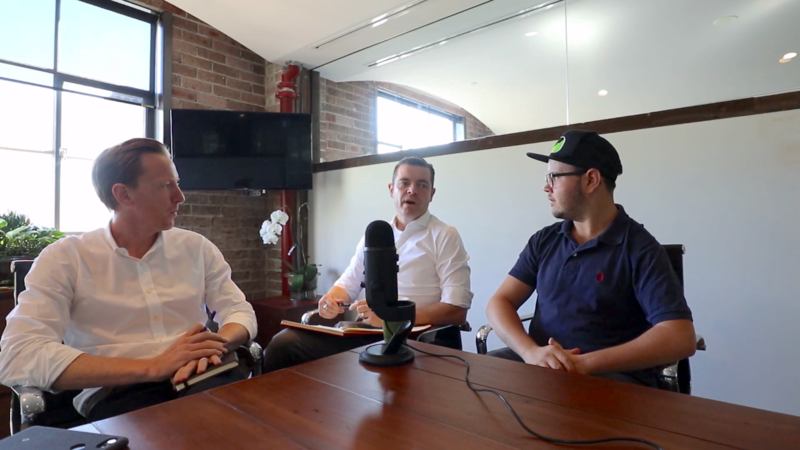 In episode 187 of the Desire To Trade Podcast, I sit down with James Whelan and Daniel Moss in Sydney to discuss trading professionally. Both work for VFS Group, a private wealth management fund. I wanted to discuss with them what it’s like to trade in a firm of the sort and what you can expect as well if you ever decide to trade professionally. In 2014, VFS Group was admitted to the BRW Top 100 Fast Starter list. In 2015, Danny was named NSW Business Chamber Young Executive of the year for the Sydney region. - It's get out of your own way, and keep it simple, don't overanalyze. That would be my advice, get out of your own way. The decision...the good outcome or the right decision is usually there if you, you know, if you get out of your way and find it, in short. - Welcome back everyone, I'm sitting down today in VFS Group with James Whelan and Danny Moss. We want to talk about the things that they do here, they have a lot of good things that they work on and some big progress. So welcome, actually, thank you for having me here, James. So, you were saying that you just moved office last year, and I think a big difference is that you said you had a few different people before but now you work only with traders. - Well, we took...and I'll let Danny go into this a bit more we had some extraneous divisions that we're still associated with but we're now geographically separated from them in this move. So, right here is the... anyway, Danny, I'll let you take it away. - Look, after ten or twelve years in the CVD it's, sort of, gone a little bit stale in there. As James was saying, we had a few different business units running concurrently but the move out of the CVD into where we are now in Darlinghurst has enabled us to tighten up our team a little bit and allow us to move focus more on the investments we make and the investment strategy behind it. Just that, move in geography has created a different environment for the culture to develop and all the people who are involved in that. - So, what's being done here, exactly? Is it trading, investing, research, or is it the execution that's done, or everything? - All the above, so everything you just mentioned from investment strategy, from research, from decision, from execution, managing clients' wealth is what we do here. - Awesome, and I think people are going to wonder a little bit about how it works in the institution when you trade, when you research so can you tell a little of the tasks that people do here and what's involved when you trade in an institution like this? - Yeah, we've a number of guys and girls who work on the floor from a trading perspective. That word, 'trading perspective' is quite encompassing so that does include...we have people who specialize in the research line of things. We have specific traders who actually execute decisions, they pull the trigger on the market or whichever market we're trading at the time and they make sure that we're doing the right transactions and making sure that we're managing our clients' money appropriately and that everyone's getting the right allocation position sizes and so on. They're some of the main functions in terms of research and execution and then portfolio management Portfolio management is the day-to-day dealing with clients and dealing with the traders to make sure that the positions are clearly done effectively and research ties in with everybody. Is that a fair chronology, there? - That's a fair assessment, yes. - Awesome, and for people who would like to work in an environment like this, what do you look for, what do they have to do, exactly, to be hired? - Everybody who works here has experience in the markets. That ranges from people who have worked from the client's side, people who have worked more on the analytical side or the research side and we look for somebody who's driven because the only way to build a company successfully is through hard work. That's all there is to it, so we look for people who are ready to work hard. - If I could add to that as well, the number of people we turn away just on a cultural basis before even coming through to have a look at the place is immense. I don't want to give a number on that one, but the...it's culture first for us on the team and us on the floor. Not to put words in Danny's mouth but yes, hard work, experience and all of those, yes, that's all, sort of, an assumed knowledge basis that you should be...but if you're not one of the team, if you're not going to be able to fit in, if you can't leave your ego at the door, then it's really not for us, because we're not that sort of shop. We're all working in the same direction. There's no individual battles, there's no individual teams going on. If we're not all steering in the same way, then this place doesn't work. That's the important part for us, that making sure that mentality is continually in the right direction, that mentality is constantly...to achieve the best result for the client, and not for the broker and not trying to fill our own pockets. - Yeah, so I think that culture is pretty apparent in the community, so like any company, pretty much. - Especially where...you're in a foxhole now. There's no big, spread open space, we're in this... Not in this room, in a different room just there, and, there's space but we're in each other's pockets we then need to know exactly what's going on because someone will see something in the US market that relates to what's going on in Europe and the guy who needs to focus on Europe at the moment needs to be focused on the Australian assets, for example. We all need to know what's going on. Being in each other's pockets, if there's any battles that's going on, it doesn't work. - Yeah, definitely. How is the communication in a team like this? People talk a lot...some people say they prefer to trade privately, they do stuff on their own but some people prefer to talk to people. - It's a very collaborative approach. There's a lot of communication. Without question, that's got to be one of our strongest assets. Everybody on the floor knows each other very well. Over time, we've developed a communication style so that we can all communicate effectively with one another in order to get to the right position at the end. So, often there's times when people's decisions will be challenged, I think that's important in terms of getting to that best outcome for the client. - It's not quite...remember Ray Dalio at his place has got that, they've got that continual challenging, challenging, challenging in the whole way. It's in that direction, not quite as affronting. There's is very...criticize it until it's blue and if you can't defend it then why did you come to the room with this idea. With us, it's more like, OK, if you can get through just the first levels, then we're all onboard and then it's going to be...it's usually a pretty good idea without tearing it apart. - So, for people who are trading, is this something that, like throw it to someone and that person would reply? - Yeah, you've got to have a sounding board. I know this is...we were talking before, sometimes, I'll come up with an idea and I'll go through it and if I don't sound it off someone there's more likelihood that it will be a loser as opposed to a win. - Usually, it's through that...just an easy sounding board, go through it, justify it. What's your idea? What's your backing behind it? And a lot of the time, it's exiting something as opposed to entering something. It's why are you exiting this situation? Are you at a profit? Are you at a loss? Why are you at this situation? As opposed to having hard stops or hard exits. For myself, it's...has the narrative changed? Has the story behind this idea changed? And if you don't bounce it off someone, it's just going round in your own head. And you know what happens with it, it just gets lost inside their own head. Everyone's idea seems great if it's just in your own... ...that's where it is. It's very collaborative. If that makes sense, sometimes I put the noise-canceling headphones on! - So, what I hear is that there's a lot of communication to determine exits or to determine trades or investments. So, what are you using... to trade and to look for different markets? How does that combine with communication in determining when to do things? - Do you want to talk about that? - A lot of the decisions we make will be mechanically driven so we're often running noise in the background of any other markets out there that we're paying attention to and we're looking to follow the momentum around the markets, we're looking at where the money is flowing and where the strength is so a lot of that's driven, not necessarily by algorithms but by analyzing data and that is one of the beginning points of our research to decide on where we're going to be, when we're going to move around the market. - A portion of portfolios is based on, yes, we see the research and we see where this market is moving, we want to take a few ideas on it, and then another portion of portfolios is opening up and is getting larger and is dedicated to... ...is being dedicated to a momentum strategy we have that, part of it is through the options market as an income generator through selling premium in, for example, gold the options over the gold futures, there's five futures, things like that. Sorry, SPX futures. We've also got another one that chooses the best directions via the ETF market. In October, November, when we triggered into gold, we've held that position since that's, for example, it just says, based on a momentum indicator, go into this. Follow that rule, and for, we still check our guts on these things. Just because the computer spits out a thing for this part of the portfolio and says it needs to be in gold or it needs to be shorter and needs to be in US dollars we don't just file that blindly You should check it and say, OK, is this what we want our clients to be at the moment. For the most part it is because the computer is right more than it's wrong. - And I guess, if you want to go against the algo then you have to really justify and have a clear reason. - You'd better really know what you're talking about if that's the case! - Throughout that period, late last year we had exposure at a very defensive level so we had US dollars, we had two cash positions and we had gold in that portion of the strategy, which market significantly in the back end of last year which was obviously good, considering how the whole time they were. A lot of that was driven by that quantum momentum indicator that kept us out of the market. It's not always about necessarily finding where to put money into the market, sometimes it's stepping back and being more defensive and that was driven entirely by our program there. - Nice. So when and how did you decide to build an algo and how did that happen exactly? - It's been a couple of years we've been working on this. You don't just decide to build an algo and then tomorrow, you have an algo. You back test data, you go back to the drawing board you sample it, you test it, is it working? Can you make it better? What can you do to tune it harder and make it perform better results, basically? So, it's been years in the making, basically is the short answer. - Yeah. So was there a point when you decided to work on this and to make this happen? - Yeah, years ago. About three years ago, we started looking into it and then deciding OK, so there's algos but do you want to create an actual algo that competes against all the other computer programs out there and is based on speed or how can we play to our strengths a bit more, how can we use a bit more of our market knowledge to work with the program to build something that can outperform. And so, a couple of years ago we started doing it, and then it's been a long road of building and testing and going back to the drawing board and scrapping that and starting again and so on. We've been running it for about two years, now. It's been performing very well. - The thing I like is to combine both, like the best of my note trading and algo trading, so kind of having the algo to help you, but still doing manual work to kind of have your edge, there. - Yeah, and the edge on execution is important too and the system that we use is quite strong to make sure that we've got the edge on the execution and that we can actually trade into these global markets. So, I was just actually having a quick flash at the performance on these, as well. You OK with those numbers? - So, in December, we're up just over three percent. which is pretty good for that December, and November we're up three-and-a-half percent, just on that strategy, on the ETF strategy. - I still shudder to think about what actually happened in the market in that period. So, that was quite good, and so, yeah if you're going to go against those signals then you'd better have a good reason. The platform that we use is quite strong. The signals are quite strong, it's... Why would you want to get in its way? So, it's just tweaking it to make sure it's absolutely perfect now, and the exits and important to that as well. Make sure the exits are right. - So, how does the algo work? Is it you that get a report daily about what you should be into or every week, every month? - Look, we're monitoring things daily, we'll be usually making decisions on a weekly basis and sometimes those decisions are 'do nothing'. That's what the decision ends up being, but we monitor it daily. We live and breath on markets so we're constantly analyzing data from around the globe on a daily basis and usually on a weekly basis is when we'll look to actually make a change or execute something but often we're happy and comfortable in positions. For instance, back in backend of last year, there was a lot of 'no change'. Just hold position. So that's what we did. There are plenty of times when we don't actually do anything, but it is something we monitor daily and look to make decisions weekly if we need to. - And so, you mentioned data, what kind of data do we look for around the world? - Primarily, driven by price. The assets that we tend to utilize are industry-based so we look at global markets on an index level, watching commodities and currencies are the main inputs into that and it's primarily driven by price and momentum. - So, you're watching what these things are doing, then you would have ideas of what to trade with that? Is that the profit side? Getting in there straight, so the algos and then the data, and then you find out what the trade? - Yeah, I mean, that's...there's a little more to it, but yes, that's it. - So, the process generally, what does that involve? - Again, it's following price and following momentum, looking to see where the strength in the market is and the idea is that we'll always be investing in the strongest asset classes. That's how it's driven. Often, at times of high volatility, the strongest asset classes are the defensive classes. Gold, US dollars, short positions in the N&P 500, for example. So, the primary driver is price and momentum across the assets that we cover. - No, we invest in it for as long as it's the strongest asset class. - If that changes, then we'll change. If it doesn't change, we don't have a reason to change. So, it means we're in the strongest asset class and we don't need to be adjusting it. We need to be monitoring it to make sure we remain in that position but, as I said, if we aren't making changes to our strategy, it means that we're in the strong asset classes, and there's no reason to change that. There's no reason to... You know, it's a very old adage but if the trend is going in the right direction, don't change it. Don't get in the way of that. That's how you can make long-term solid profits. - OK, and that's where the communication in the team is really important, to be able to know when to exit. - One hundred percent. Very much so. - How much is the technical aspect of looking at the charts in deciding on moving into investment? Is that important? - Yeah, I mean, we do look for it from an entry and exit perspective, definitely. Especially on an exit level. We might use some other technical indicators to go in an exit position, if we think something has moved too hard and too fast, and if we think there's a good amount of profit on the table today and we can look at taking that and then possibly re-entering, watching technical levels but, for the most part, again, looking for the strongest asset classes, whichever they may be. - And do you have people that specialize in technical analysis and some in research fundamentals or is it all pretty much mixed? - No, it's not mixed. We have people who specialize in their fields. We like people to be cross-skilled or cross-educated and work with each other and, if there's someone who's stronger in an area, we want them to work with someone who's weaker so we can build the overall level of the team. You're only as good as the weakest link. - But, in saying that, we do like people to be across all the portfolios and across all of our investments but there will be leaders in each of the specified fields be that portfolio management, client-facing, research, technicals - they'll be covered. - Is there any topic we didn't cover that you'd like to touch on or talk about? Anything that you feel people should know about in this industry? - No, I mean...the industry is moving into another hurdle, specifically with regards to retail advising. We're moving into another phase of regulation and regulatory change that, for us, is going to...there may be hurdles, challenges that are ahead for us and there are going to be challenges for anyone moving into the industry now that they'll have to face but that's just going to be the norm with regards to regulation. Necessary regulation, depending on what it is that comes through but nonetheless a lot of it is just based on making sure that your boxes are checked, making sure your t's are crossed and your i's are dotted and trying to maintain focus on what you're actually supposed to be doing for the client with regards to generating wealth and preserving capital. Don't forget, the most important thing is preserving capital. That focus sometimes, you've got to try and maintain that focus physically in the face of the amount of regulation that you need to be aware of. It's easy in this industry for a lot of people to say, 'We're focused on this' or 'We're focused on this regulation, we're doing it' and forget about the client. We're still trying to maintain our focus here on the client. - Yeah, there's a lot of trading and investing involved but it's also a lot about communicating, talking and communicating with clients. How does that work here, are you talking with them a frequent basis? - Individually managed accounts and we have a pretty high level of communication with them, a few times a week, usually. - Is it a fairly formal communication? - There's both aspects, from an individually managed account perspective, we're touching base...emails, text messages, liaising with clients that way but a lot of the time we try and make, where we can, phone calls or even face-to-face with clients and to review portfolios regularly. So, we like to...we do formal reviews with people, obviously as regulations stipulate, whether on an annual basis or a quarterly basis or whatever it may be, but we like to do as much as we can face-to-face where possible. This isn't a robo-advisory firm. There's people here and our clients are people as well. So, that's the idea, we're trying to keep that relationship strong, keep the communication strong. Let them know what we're doing and why we're doing it and again, same as we have ideas challenged by other portfolio managers on the floor, if a client challenges an idea, we need to be able to speak to why we're doing it and validate our decision-making process with them as well. At the end of the day, we are the custodians of their wealth and we take that very seriously. - How do you get over the tough times, like the drawdowns, is it the same thing as your normal period of winter or different? - How do you deal with drawdowns? - There are times when asset prices go up and down obviously, different clients have different timeframes of investment obviously, so we juggle the strategy or the allocation to the different strategies around that investment time rising. If you have a younger client with lots of years left to work and continues to generate income, high level of risk so their strategy may look different someone who's more transitioning into retirement and looking to build up income streams. So there's different avenues and different ways of dealing with it but markets go up and markets go down. - You need to manage that risk appropriately. And then, obviously, keep in discussion with our clients as to what we're doing, why we're doing it. - What does it take for someone to invest here? Do they have to be comfortable with the risk involved? Do you require them to have a minimum income to invest? How does that work? - Yeah, all of the above. We'll meet a client and we'll obviously go through a process to establish where they fit within VFS. So, as I said, we have younger clients who have a higher tolerance to risk, their investment time rise is much different to someone who's at the tail end of their working life, and then we fill out risk profiles, together we work out and develop an investment mandate on something which we think is appropriate for them and they're comfortable and understanding with and then that forms the basis of our investment mandate and how we're going to investing their money thereafter. - How do you find out the risk profile of someone? - Yeah, so we work through with client questionnaires. So we establish some basic questions as to what their risk profile would be. - What you have here, is that a general thing? - Financial questionnaires such as this pretty common for retail advisory. Especially when dealing with an MDA, a managed discretionary account-style portfolio. So, yes we have our own one but it's not unique to the industry, it's pretty commonplace. - Awesome, cool. How can I find out about you or reach out to you? - Our website vfsgroup.com.au has the details. My email address, I have 'gmf' because I run a Global Macro Fund I'm gmf@vfsgroup.com.au and I can handle anything that goes through on to that. - But the website's got all the details in it and all sorts of things. Is there anything you need to know? - And you're on Twitter as well? - We'll put some links below the video. - I've actually now started on Monday on the bus coming into work, I now delete Twitter from my phone. - So, it's only available when I'm here, there or when I'm at my desk or when I'm at home, but there's no Twitter on my phone anymore. And I found my productivity has gone through the roof! And I'm not listening to any of the noise or anything like that anymore. - So, you're actually focusing on what you know you should do plus productivity, that being the strategy? - That's right. Just trying to cut out some of the distractions. - Just focusing on what actually, what actually helps us and helps our clients. And, 'just getting out of your own way' is one of Danny's expressions! The number of things that people do that just puts own roadblocks in front of yourself and prevents you from getting to your goals, when you realize just how many of those things that you do and you start taking them out of the way this light appears in front of you. So, that's what we're focusing on. It's what I'm focusing on in 2019. - And, I have just one question that I've asked all my guests in the podcast before and I've asked you, privately, before so maybe you can answer. My question is, if you could give traders one piece of advice on how they can thrive as traders what would that one piece of advice be? - As James just said, it's 'get out of your own way'. And keep it simple, don't overanalyze. That would be my advice, get out of your own way. The decision...the good outcome or the right decision is usually there if you, you know, if you get out of your way and find it, in short. - That's it. So, thank you guys, I appreciate it. - Yes, I appreciate it. - And we'll catch you guys pretty soon. How To Find James Whelan & Daniel Moss?